Nanette got herself an ice cream maker for her birthday and ever since (it has only been a couple weeks) we have been chatting about ice cream and gelato. She made a cinnamon gelato that was sweetened with honey and said it was to die for. Since we were pretty sure a big bowl of it would not make the flight over from Melbourne, she passed along the recipe and in true Chez Us form I decided to up the game with this recipe for Cinnamon Gelato with Malassadas. I decided to remake a Portuguese favorite, the Malassada, to serve with it. Instead of the traditional big piece of “fried” dough, I gently fried small little pillows of the batter and then rolled them in unrefined sugar that I barely kissed with orange essence. The slightly sweet fried dough went so well with the warm honeyed ice cream. The only thing missing was a friend to share this with. You will not want to miss Nanette’s Gelato, she served hers with a warm sugary plate of Loukoumades – she gives you the easiest recipe for making Loukoumades as well; guess what I will be making next time! Bring milk, cream, cinnamon, and honey slowly to the small boil in a saucepan. Remove from heat and temper your egg yolks into the mixture. Once tempered slowly add to the milk mixture and whisk to incorporate. Return to a very low heat and slightly simmer, while stirring constantly, for about 5 minutes. It is very important to continue to stir and to do it over low heat or you will scramble your mixture. Remove from the heat and transfer the mixture to a bowl. When it’s cool, place the bowl in the refrigerator for at least 30 minutes (I left it overnight). Put the mixture into your ice cream machine and process according to the instructions included. Mix yeast with 1 T. of sugar and warm water, set aside in a warm place until foamy. Heat milk with butter and salt until hot but not boiling. Take off of heat and let cool slightly. Mix flour with 2 T. of sugar. Mix in 4 eggs and extract. Add the milk mixture slowly and mix. Add the yeast mixture and stir well. Let sit about 20 minutes. Then knead, may need to add more flour, if the dough is too sticky. Do this process 3 times. Then let rise in a warm place, until doubled, about an hour. Heat canola oil until very hot. Drop small handful, stretched slightly, into the hot oil. cook and turn until golden brown. I like to lay them on a paper towel to absorb extra oil. While still warm, roll them in sugar until coated. 21 Responses to "Cinnamon Gelato with Malassadas"
Oh my word that looks good. I'd eat it for breakfast (and lunch, and supper) in a heartbeat. Wish I had some now. That would make me eat breakfast regularly! Can I have some? :) I can almost steal a spoonful and a bite! Clearly I need to stop commenting from my iPhone. Can't believe I mistyped my name! This is my kind of breakfast. I love the idea of serving this with the Malasadas. Beautiful! We've been going to North Truro, Cape Cod for over ten years, and there's a huge Portuguese population there. Our favorite stop is at The Portuguese Bakery on Commercial Street in Provincetown. During our two-week stay, we spend many an afternoon there snacking on malasadas and trutas. I don't make ice cream or pastries but I sure wouldn't pass this up if someone offered it to me. Nice pairing of flavors and textures. Only thing missing is a glass of port from Portugal! Bella what flavour shall we make next?! This gelato is beautiful! I love your ingredients, from the full fat milk to the raw honey! Beautiful!! Drooling at the Masaladas, they are calling my name! I love Malasadas. My friend growing up, her mother would make Malasadas for breakfast, and she would bring one to me. They were fantastic!!! This is a perfect dessert! The gelato sounds divine, and those malasadas look irresistible. Wow, delicious. The gelato pairs beautifully with the Malasadas. I have never eaten them before, but they sure look more-ish! wow these look so yummy! 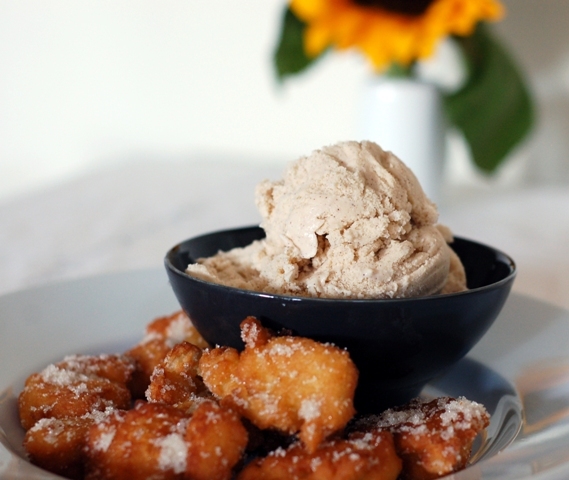 fried dough fritters and gelato sounds like a wonderful pairing. I really must pull my ice cream maker out to start making these.. The fried dough is new to me. Very interesting!